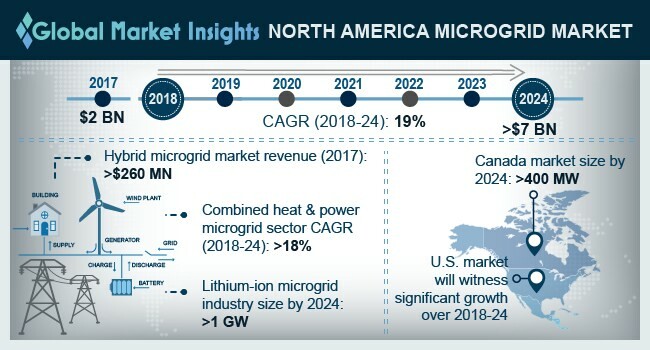 North America Microgrid Market size will exceed USD 7 billion by 2024, as reported in the latest study by Global Market Insights, Inc. Favorable government policies pertaining to integration of sustainable energy technology along with aging grid infrastructure will foster the North America microgrid market. Relatively low power cost, reliability, economic competitiveness and reduced transmission losses are some of the underlined parameters which will encourage the product adoption. In addition, increasing investments toward the expansion of distributed generation technologies will further complement the industry growth. Increasing penetration of captive power plants to provide regulated power supply across the industrial and manufacturing sector will expand the North America microgrid market size. In addition, the upsurge in investments toward the development of decentralized grid along with growing investment opportunities toward infrastructure and energy sector will further propel the industry growth. According to the Government of Canada, in 2016, around USD 900 million were invested toward research, development and deployment of various energy sources across the nation. Increasing spending toward the exploration of unconventional reserves on account of growing gas demand across the region will propel the natural gas microgrid market. Favorable government initiatives and policies toward the development of low emission fuel as a substitute to conventional fuel sources will stimulate the industry growth. For instance, in 2017, Amren Corporation announced the completion of technologically advanced microgrid network which uses wind, solar and natural gas as a power source with advanced automation and battery storage system. Extensive electricity requirement for manufacturing operations, industries, offices, retail outlets, automotive and hospitals will complement the microgrid market across industries/commercial applications. In addition, escalating high end power consumption on account of the presence of new heavy load machinery and HVAC systems will complement the business outlook. According to EIA in 2017, the industrial and commercial sector consumed 22.4% and 4.5% of the primary energy respectively. Flow battery in 2017, accounted for over 5% of the North America microgrid market share. Rapid technological advancement toward the development of efficient and cost-effective storage systems coupled with growing investments toward the integration of renewable grid infrastructure will positively influence the product demand. High efficiency and longer life cycles are some of the key features which will make its adoption preferable over other alternatives.